Can I park in a disabled bay? You can only park in a disabled bay if you are a Blue Badge holder. You must display the badge properly. The Blue Badge must be being used in accordance with the Department for Transport conditions of use. Why do we have disabled bays? We have disabled bays so Blue Badge holders can park close to their destination. How do I know when the restriction applies? The sign on the street will tell you this. If no times are shown the bay operates at all times, 24 hours a day and every day. With the exception of personalised disabled bays which may only be used by the disabled permit holder. Is there a list of disabled bays available? You can see the list of disabled bays (PDF 85KB) document for a full list of streets in Brighton & Hove with disabled bays. If you have a Blue Badge you can apply for a disabled parking bay. I have received a Penalty Charge Notice when using a disabled bay what do I do? 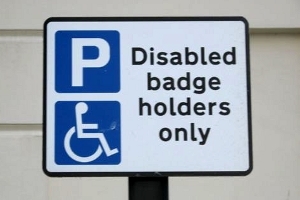 You should check that your Blue Badge is displayed in accordance with the Department for Transport conditions of use. We are now issuing Regulation 10 Penalty Charge Notices. This means that if you are seen, by a Civil Enforcement Officer, to be parked on a on a zig-zig we can issue a notice by post. This will be sent to the registered keeper of the vehicle.